Do you crave adventure? Do you dream of piles of treasure? Do you have fantasies of making The Big Strike? Then put on your Raiders hat and grab your shovel–when you dig into this treasure chest you’ll feel like you discovered King Solomon’s Mines! The King Solomon Chest is filled with over 60 gallons of super rich gem dirt, with more than a QUARTER MILLION carats of rough natural gems. When you mine this chest you’ll find thousands of stones-rubies, sapphires, emeralds, moonstone, aquamarine, kyanite, rose quartz, garnets, fluorite, smoky quartz, sodalite, calcite, green and blue quartz, citrine, and amethysts. You’ll also find colored quartzes, feldspars, and other beautiful stones in this native dirt that comes right off our mountain. You might even find Indian artifacts and some gold, too! 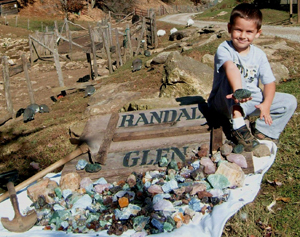 And talk about treasure–you’ll find hundreds of stones of cuttable and specimen size. Imagine holding your own 500-carat ruby! How about a 1200-carat sapphire or an emerald the size of a tennis ball? We guarantee you’ll find specimen stones of over 1000 carats. In fact, the King Solomon Chest is so rich, we’ll provide 5-gallon buckets for you to carry away your finds. Mine this treasure trove yourself, or bring your family-bring a crowd! There’s so much in this chest, you can mine it today and come back tomorrow to mine some more. Or for the best adventure of all, come and stay at one of our luxury cabins and mine every day from your own private hoard! WE GUARANTEE YOU WILL NOT FIND A MINING EXPERIENCE LIKE THIS ANYWHERE IN THE WORLD. 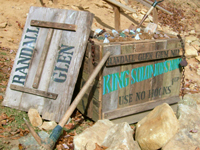 The King Solomon Chest is available at the Randall Glen Gem Mine, open 10 AM – 5 PM every day except Monday. The price for mining the King Solomon Chest is $1,000, not including the wooden chest. Any number of people may mine, and you are welcome to mine the chest over a period of days. For more information or to reserve the King Solomon Chest, email us at info@randallglen.com or call 828-683-5758.